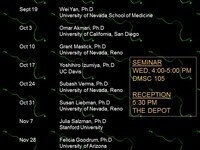 The Neuro/CMB Seminar Series hosts talks by prominent faculty researchers. It typically focuses on completed research or research-in-progress in the fields of neuroscience and cell and molecular biology. The weekly seminar series are held Wednesdays, 4-5 pm during the academic year. The seminars are located in the Davidson Math and Science center, Room 105. Seminars are open to all. Undergraduates, graduate students, faculty and non-faculty researchers are especially encouraged to attend. Students taking CMB 790 may earn 1 credit for each semester of regular attendance. Seminar Directors for 2018/19: Dennis Mathew, Ph.D. (dennismathew@unr.edu), Yong Zhang, Ph.D. (yongzhang@unr.edu).